In Purity 5.1 (and actually also 5.0.7 and planned for 4.10.x too, but not yet) we improved our support for WRITE SAME. For the most part the speed of our WRITE SAME handling was rather good–we don’t even write any zeroes, we just mark some metadata and return zeroes if read from. So it is almost a non-op for the FlashArray. That being said there was some room for improvement. We had some support cases around VVols where migrations were kicked off and they took a bit longer than expected. Turns out this had to do with our handling of large WRITE SAMES (ESXi WS I/Os are generally 1 MB). Our sub-system was not tuned well for WRITE SAME of that size–which is somewhat silly since WRITE SAME is almost invariably that size. So we improved our handling of it. Let’s run through some before and after tests. Let’s do the most common proof point of WRITE SAME–creating eagerzeroedthick virtual disks. When you create EZT disk, ESXi will first zero the whole thing out before it can be used. If the underlying storage supports WRITE SAME it will issue that. So let’s run a quick test with WRITE SAME disabled just to get a baseline. 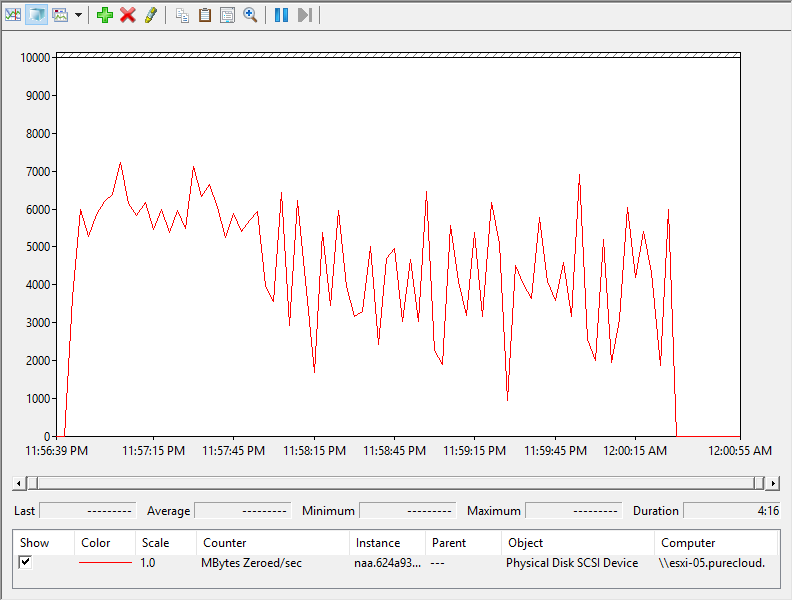 Then I will use PowerCLI to create a new 1 TB eagerzeroedthick virtual disk. Using the measure-command cmdlet, it shows that it takes 17 minutes and 6 seconds to complete. Quite some time. 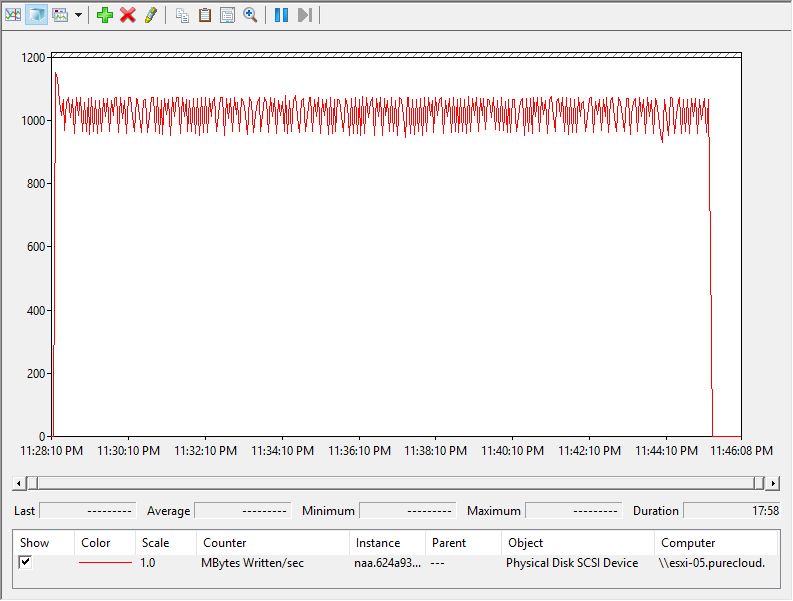 I also recorded esxtop and it shows 1 GB/s of writes going on the entire time. Time to re-enable WRITE SAME. I will first run it on the array running old code (my m50). The WRITE SAME throughput is averages around 5 GB/s. Note that WRITE SAME throughput is not the same as regular I/O throughput–it is rather effective throughput, not the actual size of the I/Os. A 1 MB WRITE SAME I/O is not 1 MB in size, it just describes 1 MB of blocks–in reality it is quite small of an I/O. 1 minute and 10 seconds–3x faster than before. 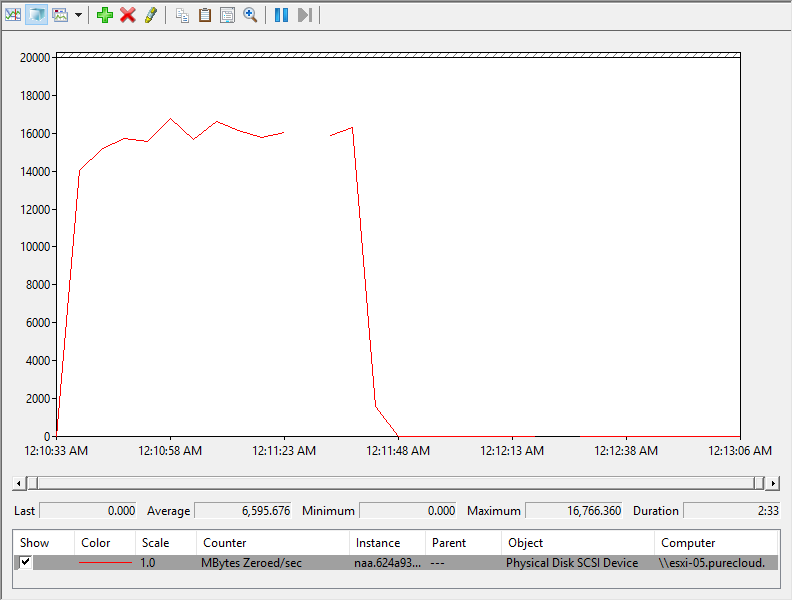 The WRITE SAME throughput jumped through the roof to average around 15 GB/s. The other major area WRITE SAME is used is during lazy zeroing. 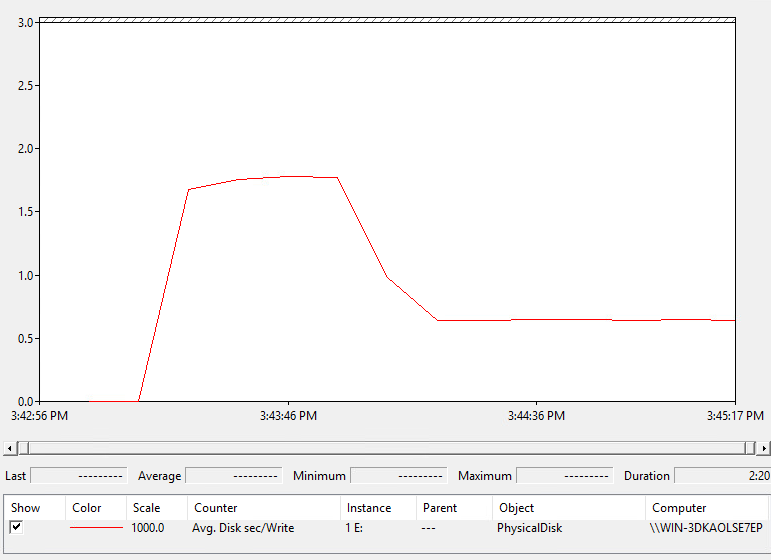 In VMFS, ESXi will always zero out a virtual disk before a guest can write to it. When this zeroing happens is what changes. For eagerzeroedthick virtual disks it happens when it is created as shown above. For zeroedthick or thin it happens when the guest issues a write that goes to a new block. 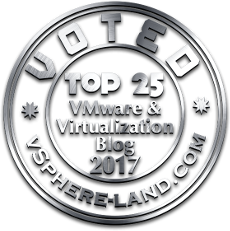 When a new block is needed, VMware will first zero it out and the guest can commit its writes. When that block is filled, the next one will be zeroed and then the data committed and so on. 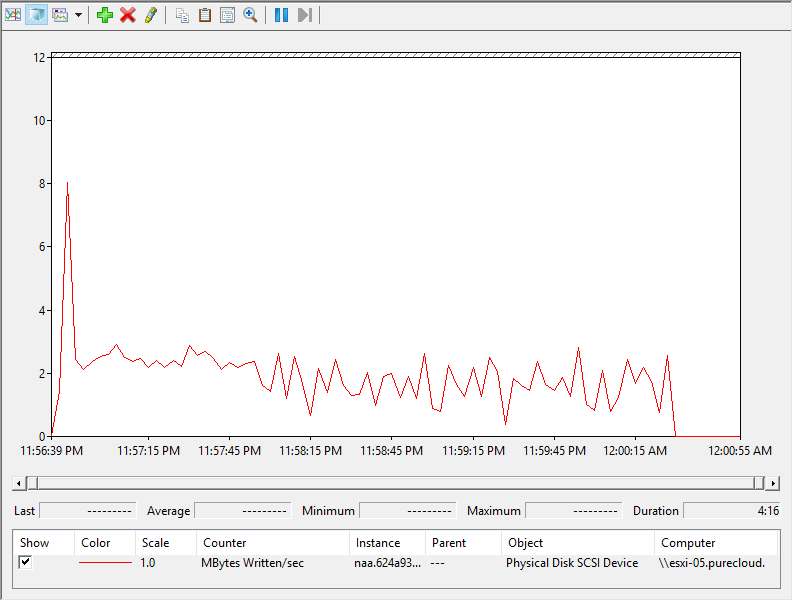 This is why there is a slight latency penalty for new writes in zeroedthick and thin virtual disks on VMFS (as seen in this post). With an improvement in WRITE SAME handling, let’s see if there is a performance improvement in new writes inside of a virtual disk. I kicked off a vdbench workload with 100% sequential write 32 KB I/O size with 32 outstanding I/Os against a thin virtual disk and I ran it until the 20 GB virtual disk became fully allocated. The latency for the first 40 seconds was around 2.25 ms. Most of this latency was due to guest I/Os waiting for WRITE SAME to be issued first. Once the 20 GB was fully allocated, no more WRITE SAME had to be issued, so there is no allocation penalty and the average latency dropped to .7 ms. The allocation penalty period is shorter–30 seconds instead of 40. The latency during the allocation period is lower, 1.6 ms instead of 2.25. So in short, a nice internal enhancement. Of course none of this matters too much with VVols 🙂 Thin VVols do not have an allocation penalty and there is no such thing on the FlashArray as a thick VVol, but since VMFS is still the majority at this point this is likely relevant for many. Stay tuned for more posts from 5.1. 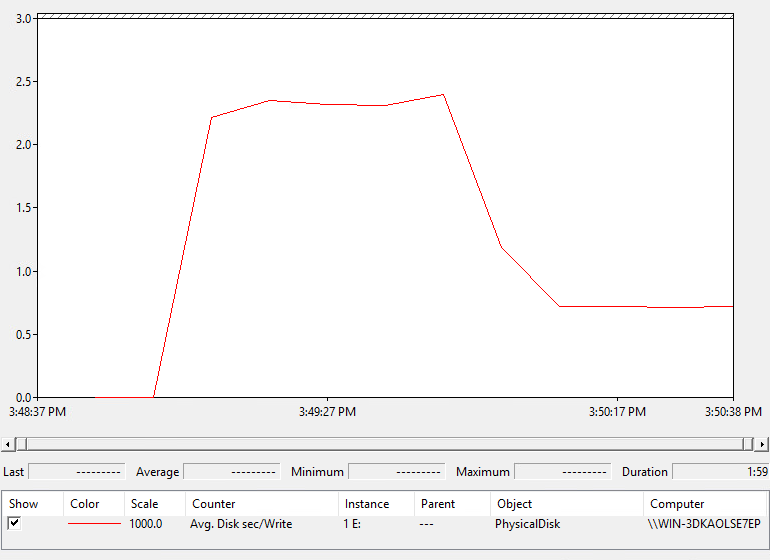 The size of system state partition has drastically increased since we have upgraded to 5.0.7. Is this a expected behavior? No–please open a support case with Pure. Thank you!